Right off the bat, “This soap is different”. Nature’s Plus Natural Beauty Cleansing Bar. You don’t get much of a bar @ 3.5oz net weight but the lack of bar mass is truly made up by the quality of this soap. This hyper ph balanced soap tripped me out because it actually smells of PH with a light twist of citrus, super clean and pure. It has a clay like texture when washing body. The lather is real light and airy. This soaps overall sensation to me was like being at super sterile public swimming pool. I actually almost bought another one the other day thinking of your post. I myself love that soap. I feel like I am at the swimming pool when I use it. Hi, are you able to find more bars of soap with a low pH (4,5-5.5) I am glad there’s someone else out there with a soap fetish. What do you think of Aleppo soap? I have 5 genuine bars that I won’t use-they are like gold. 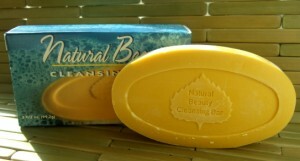 I have ordered this Natures plus natural beauty soap (5 bars) because I think they’re going to stop making it. That’s why I’m asking if you’ll help me look for a bar soap with low pH. Yes…Meto…I have a Soap Fetish…That is the reason I started this site. Every soap that is reviewed here on SoapQuest has actually been personally used by me or one of my other Soap Users.